Whisker Menu is an application menu / launcher for Xfce that features a search function so you can easily find the application you want to launch. The menu supports browsing apps by category, you can add applications to favorites and more. The tool is used as the default Xubuntu application menu starting with the latest 14.04 release and in Linux Mint Xfce starting with version 15 (Olivia). The Whisker Menu PPA was updated to the latest 1.4.0 version recently and you can use to both upgrade to the latest version obviously, as well as to install the tool in (X)Ubuntu versions for which Whisker Menu isn't available in the official repositories (supported versions: Ubuntu 14.04, 13.10 and 12.04 and the corresponding Linux Mint versions). Note: I've only tested the latest Whisker Menu 1.4.0 in Xubuntu 14.04. If this is a new Whisker Menu installation, add the menu to the panel by right clicking the panel and selecting: Panel > Add New Items, then select "Whisker Menu" and click "Add". 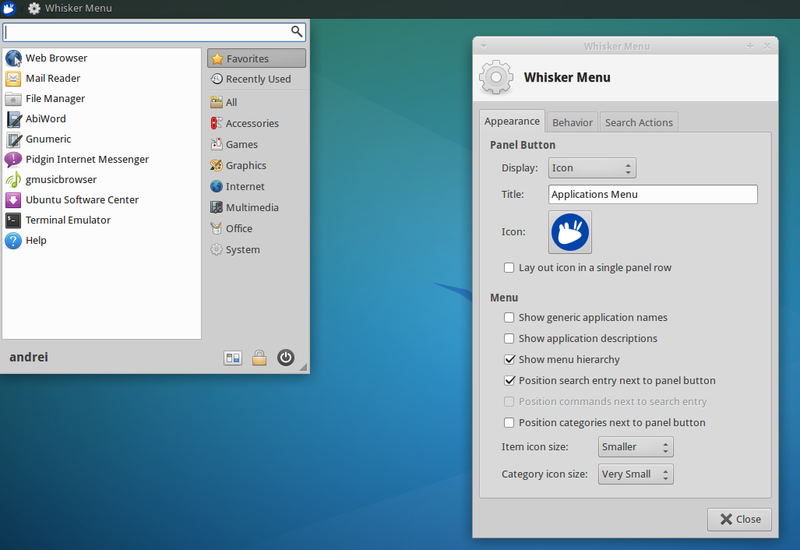 If you're not using Ubuntu / Linux Mint, grab Whisker Menu from HERE. Arch Linux: install Whisker Menu via AUR.